This year at the SWL Winterfest we had a presentation on the topic of $20 SDRs configured like those above. Some scanner enthusiasts had used them to receive satellite and many other VHF/UHF communications. I’ve heard of some devices being nearly plug-and-play easy to install and configure; others may take some minor tweaking. All of the SDR applications and drivers are either open source or free. This page contains a wealth of information on the topic of RTL2832U based SDRs–it makes for a great starting point. 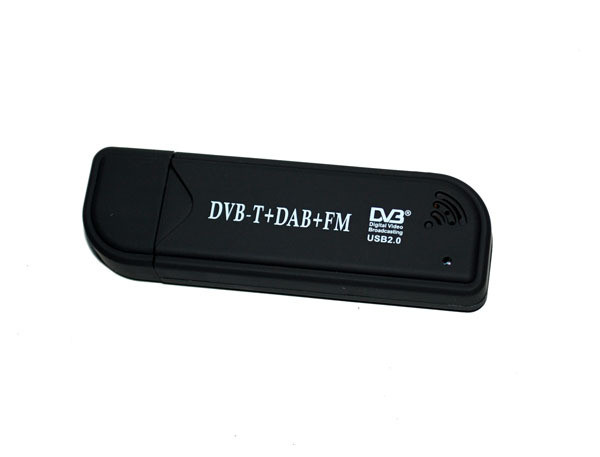 If you have experimented with thRTL2832U USB SDR, please comment below. This entry was posted in How To, Software Defined Radio and tagged $20 SDR, $40 SDR, Cheap SDRs, Cheap Software Defined Radios, RTL2832U, RTL2832U SDR, SDR, Software Defined Radio, UHF, VHF on July 5, 2013 by Thomas. By adding a 3 pole double throw switch and a toroid balun, the device covers LF/MF/HF/VHF/UHF to beyond 1.7GHz. It does AM/FM/SSB/CW/DIGITAL VOICE AND SSTV. I have one of the Dongle rcvrs but can’t seem to get the drivers to work right. Wish they had a plug and play software that I just installed with a install feature. The manual on eBay really works and you don’t have to spend $50 on a converter board to receive broadcast to 30 mHz. My E-mail is obbm1@hotmail.com if you have questions. I bought the CD, and it works very well. I have made three conversions. I have an RTL-SDR system up and running. I have done 2 demonstrations for my local Ham Radio club. One on the basic setup and use of the dongle, using both SDR# and HDSDR. The other presentation showed the remote receiver capability using a Raspberry Pi as the receiver with the dongle attached and a remote SDR# computer decoding the stream over a network connection. Once I compensate for some minor frequency discrepancies it’s a pretty good receiver. The only issue I have noticed with mine (one of the early E4000-based models) is a tendency to overload in the presence of a strong signal. We have a pretty powerful 2 Meter repeater less than a 1/4 mile from our home, and when it’s active it causes some strange results with the RTL-SDR setup. I have yet to try one of the HF converters they make for these. I hope to do that soon. Another project I was reading about today that I may try out is using 2 of the dongles at once to create a trunk-tracker scanner. Wow–I had never thought of using two SDR dongles for trunking, nor of remote access. We have a very strong AM station on 1010 kHz–I do wonder if these receivers would be overwhelmed by it if adapted for HF listening. Not too many FM powerhouses, though. Of course, I suppose I could try various band filters to help. Even with the strong repeater running on 147 MHz I still receive plenty. One thing it was handy for was spotting 2 Meter USB signals when using my Kenwood all-mode rig. I’ve been using these amazing devices for a few months, with great results. Thank you, Pat! Some great comparisons with the FunCube dongle!